Diabetic retinopathy is the most common diabetic eye disease and a leading cause of blindness in American adults. High blood sugar levels associated with diabetes mellitus can damage blood vessels in the retina—the nerve layer at the back of the eye that senses light and helps send images to the brain. This damage is called diabetic retinopathy. In some people with diabetic retinopathy, blood vessels may swell and leak fluid. In other people, abnormal new blood vessels grow on the surface of the retina. Diabetic retinopathy usually affects both eyes. People often don't notice changes in their vision in the disease's early stages. But as it progresses, diabetic retinopathy usually causes vision loss that in many cases cannot be reversed. If you have diabetic eye disease, you may need an eye exam more often. 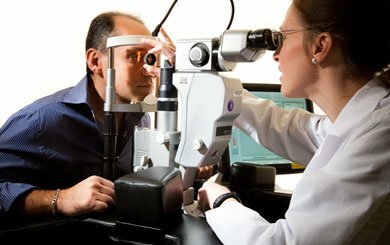 People with proliferative retinopathy can reduce their risk of blindness by 95 percent with timely treatment and appropriate follow-up care. What are the four stages of diabetic retinopathy? Mild Nonproliferative Retinopathy: At this earliest stage, microaneurysms occur. They are small areas of balloon-like swelling in the retina's tiny blood vessels. Moderate Nonproliferative Retinopathy: As the disease progresses, some blood vessels that nourish the retina are blocked. This closing of the capillaries is referred to as macular ischemia. Severe Nonproliferative Retinopathy: Many more blood vessels are blocked, depriving several areas of the retina of their blood supply. These areas of the retina send signals to the body to grow new blood vessels for nourishment. Proliferative Retinopathy: At this advanced stage, the signals sent by the retina for nourishment trigger the growth of new blood vessels. These new blood vessels are abnormal and fragile. They grow along the retina and the surface of the clear vitreous gel that fills the inside of the eye. By themselves, these blood vessels do not cause symptoms or vision loss. However, they have thin, fragile walls. If they leak blood, severe vision loss and even blindness can result. **Macular edema, a condition caused by fluid leaking into the center of the macula, can occur at any stage of diabetic retinopathy. About half of people with advanced, or proliferative, retinopathy also have macular edema, which causes blurry vision. All people with diabetes—both type 1 and type 2—are at risk for diabetic eye disease. That's why everyone with diabetes should get a comprehensive dilated eye exam at least once a year. The longer people have diabetes, the more likely they are to get diabetic retinopathy. Between 40 and 45 percent of Americans diagnosed with diabetes are at some stage of diabetic retinopathy. During pregnancy, diabetic retinopathy may be a problem for women with diabetes. To protect vision, every pregnant woman with diabetes should have a comprehensive dilated eye exam as soon as possible. Your doctor may recommend additional exams during your pregnancy. What are the symptoms of diabetic eye disease? Often there are no symptoms in the early stages of the disease, nor is there any pain. But if you have diabetes, don't wait for symptoms; be sure to have a comprehensive dilated eye exam at least once a year. Diabetes can cause changes in the vision of both eyes, even if you do not have retinopathy. Rapid changes in your blood sugar change the shape of your eye's lens, causing the image on the retina to become out of focus. After your blood sugar stabilizes, the image will return to focus. You can reduce episodes of blurred vision by maintaining good control of your blood sugar. What are the symptoms of advanced stage proliferative retinopathy? The new blood vessels on the surface of the retina, which characterize proliferative retinopathy, can bleed into the eye and block vision. At first, you will see a few specks of blood, or spots, "floating" in your vision. If you see spots, contact your eye care professional as soon as possible. You may need treatment before more serious bleeding occurs. These hemorrhages tend to happen more than once, often during sleep. Sometimes, without treatment, the spots clear, and you will see better. However, bleeding can recur and cause severely blurred vision. You need to be examined by your eye care professional at the first sign of blurred vision, before more bleeding occurs. Early detection and treatment by a retinal ophthalmologist can minimize or prevent vision loss caused by diabetes. Contact Retina Vitreous Associates in Illinois or Indiana to schedule an appointment with one of our board-certified retina specialists.